Like we said before, it's not easy to buy lace front wigs if you don't have all the information to help you make the best choice. The interweb is full of lace wig websites with similar sounding names and the quality and quantity of information can be both underwhelming and confusing. Some websites don't offer any real information about lace wigs, others offer patchy information and others go for broke and just offer wrong information like “medium size wig caps fit almost everybody”. Oh, they do...? Really? Do medium size caps fit the head of the contestants in the world’s strongest man completion? We don't think so; and whilst we don’t claim to even begin to think that we could possibly know a tenth of everything about wigs, hair extensions and hairpieces, we defo know a few things and we know a few more about what to think about before you buy lace front wigs or full lace wigs. Bleached knots on lace front wigs and full lace wigs helps minimize the dotty appearance that can be seen when dark hair is ventilated (tied) to the lace. Bleaching of knots doesn't create transparent (clear) or white knots, but it lightens the colour of the hair so that the knots are less visible (not invisible, just less visible). Back in the day (say, around 2005) bleached knots were a standard feature on lace wigs, but that was a long, long time ago and now things are different. Bleached knots are no longer a standard feature; you have to check the listing of the lace wig to find out. Some retailers don't mention whether the knots are bleached (we do because we want people to know everything they possibly can about an item before they buy). The bleached knots feature isn't an issue for everyone, some people prefer it, others don't and some aren't fussed either way. We stock both versions and have to admit that both types equally appeal to people equally. As the wearer, all you have to do is decide whether it's a deal breaker or not. If you've already been online to buy lace front wigs and now you've found that the knots are unbleached, contact the retailer to return the wigs. If the retailer's return policy doesn't allow you to return them for this reason, then you can use a concealer on the parting or perimeter or, if you're feeling very brave, dye the knots yourself bleach the knots yourself. 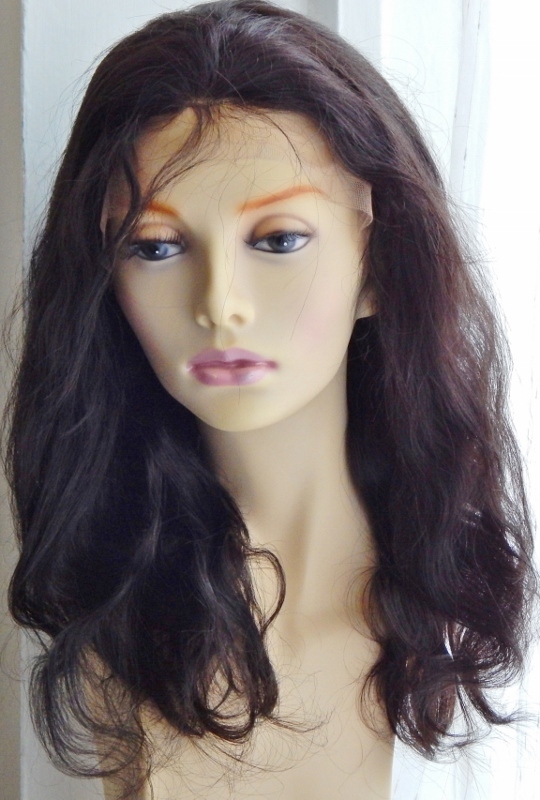 Ok, before you say it, we know that if you've designed your own wig, or chosen certain colours, you will be well aware that the lace front wig or full lace wig has been dyed. However, what a lot of folks don't realise is that darker colours like #1, #1b, #2, #3, #4 are often dyed too. This means that if you then tried to dye the wig to red or chestnut brown, you have to be aware that the hair may take the colour in a way you aren't expecting. As a rule, you always have to lift dark hair colours to very light colours in stages (so supermarket dye-in-the-box won't make jet black hair, platinum blonde in one fell swoop - sorry, just sayin'). Non-Remy hair isn't actually a hair crime. In fact, there's a whole bunch of non-Remy hair on the hair market and it's used for braided hair extensions, stick tip hair extensions, sew-in hair weave and yes, wigs. In fact, why not think about your local hair and beauty supply store; how many wigs and hair extensions don't have the word Remy stamped all over them? Without a doubt, Remy hair is better than non-Remy hair - cuticles are intact and facing the same direction - happy, healthy hair days ahead (if you treat it right, of course). However, consider something else for a moment - all hair textures tangle. There are combs and brushes specifically designed to undertake the dreaded task of d-e-t-a-n-g-l-i-n-g. Our natural growth hair would qualify as "Remy hair" and yet every hair single type of hair texture experiences tangling - including naturally straight and wavy textures (the Tangle Teezer was originally created specifically for those textures). If the hair has cuticles but they face different directions you'll need to use styling products (probably with silicone) to smooth out the hair and make it look shiny. If the hair doesn't have cuticles then you'll have to use styling products (probably with silicone) to smooth out the hair and make it look shiny; and you'll have to face the fact that the dyed colour will fade more quickly than usual because the cuticles aren't present. Body Wave Lace Front Wig - Not used on a "red carpet"
When you're looking to buy lace front wigs, you will come across sites that use images of singers and actresses and suggest that the lace front wig you'll receive will be identical; which is unlikely for so many reasons that we won't even get into discussing them. The main thing however is to know that a #1b-auburn, body wave lace front wig of standard 120-130% density is unlikely to resemble the hair of a starlet at a "red carpet" multi-million dollar film premiere; it just isn't. What can you do about this? Either get the retailer to send you some actual images, or find out what such a lace front wig actually looks like... (and in case you're wondering, it actually looks like the image to the right).